The Channel Islands are an outdoor adventurer’s dream. The five islands — Santa Cruz, San Miguel, Anacapa, Santa Barbara and Santa Rosa — provide a peaceful escape from Southern California’s metropolitan areas, with miles of breathtaking coastal views, beautiful beaches, excellent hiking trails and more. The adventure begins with a scenic boat ride to the islands from Ventura County Coast, during which you might receive a warm greeting from whales or dolphins. 60-90 minute boat rides are available to the islands from Oxnard and Ventura Harbor. Schedules vary depending on the season. Once you arrive, try one of the following best Channel Islands outdoor activities for an unforgettable adventure. 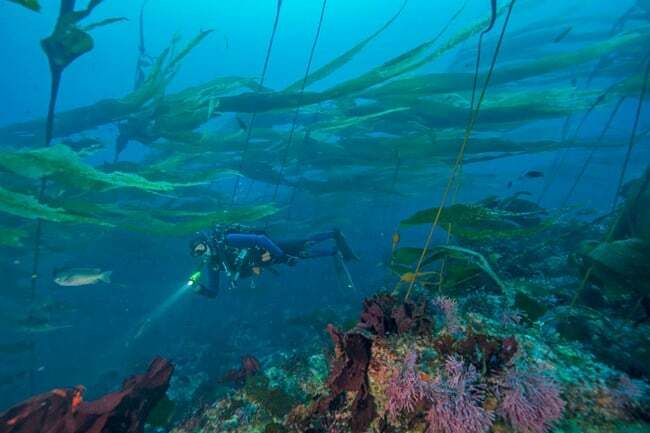 With its giant kelp forests and marine life, the Channel Islands is a known playground for divers and offers a unique and memorable scuba diving experience. Channel Islands Adventure Company offers a guided snorkeling tour along the gorgeous shoreline of Scorpion Anchorage on Santa Cruz Island. It’s the perfect opportunity to see the beauty of the sea caves and sea life. Gear rental is included in the price of the snorkeling tours, and the tours are open to all levels. Hiking is one of the best ways to experience the Channel Islands National Park. From easy hikes for beginners to advanced hikes for those who are more experienced, there is something for everyone at every skill level. A popular hike is Smugglers Cove on Santa Cruz Island, which offers gorgeous views of the ocean, valleys, mountains, and you’ll see the lush island plants and wildlife. Over on Anacapa Island, guests can experience easier hiking trails with spectacular views. Anacapa is just an hour away from Ventura Harbor Village by boat, and the easy trails make it a great place for families with hiking for all ages. Camping is available as well. Channel Islands National Park is a premier destination for whale watching. Whales and dolphins put on quite the show for guests who board the whale watching tours that sail between Ventura County Coast and the Channel Islands. Island Packers offers tours that give guests a chance to see gray whales as they make their annual migration from late December through mid-April. In the summer months, humpback whales and occasionally giant blue whales can be seen on the tours. Kayaking is another great way to explore the spectacular sea caves at Scorpion Anchorage on Santa Cruz Island. Santa Barbara Adventure Company’s Adventure Sea Cave Kayak Tour meets twice a day on the island and offers up to three hours of kayaking through some of the world’s most beautiful sea caves. Be sure to catch the ferry from Ventura Harbor no later than 9 a.m. to catch this memorable experience. With so many great activities and places to explore on the Channel Islands, you’ll certainly want to stay a while. Year-round camping is available on each of the islands, or you can catch an afternoon or evening boat ride back to the mainland and find great accommodations in Oxnard, Ventura, Port Hueneme or Camarillo. Click here for the complete list of hotels and other places to stay in Ventura County Coast!